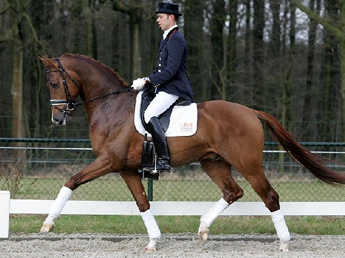 Vivaldi, chestnut Dutch Warmblood Stallion, by (Krack C / Jazz prf) born in 2002, standing approximately 16.3 hands. 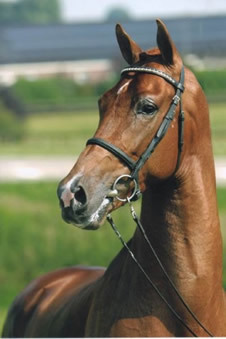 Vivaldi presents a well-built and developed riding horse type with a good rectangular frame. 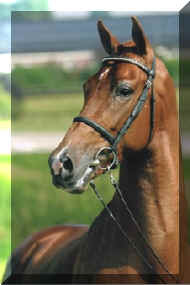 His uphill conformation is highlighted by an especially appealing front end--he has inherited the amazing forearm elevation and extension of his illustrious sire, Krack C. Vivaldi is an honest and reliable stallion with a very good attitude and a great willingness to work, possessing a compliant temperament. His walk is correct, spacious and supple; the trot is spacious, well carried, and supple with a good foreleg technique; the hindleg is actively bent and carried well underneath; the canter is spacious and uphill. 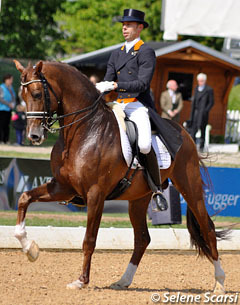 As a dressage horse Vivaldi exhibits extreme natural ability and gives his rider a very good feeling. 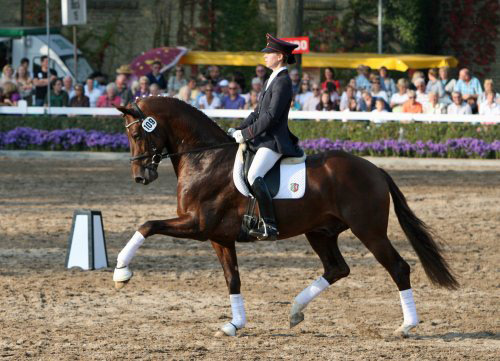 As a performance horse, Vivaldi is well on his way to a stanout career. 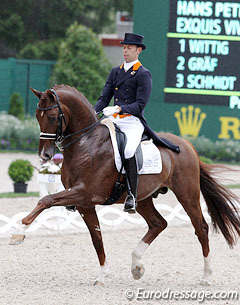 As a still-young horse he was fourth place in the first day of the Pavo cup for 4 year-old dressage horses, 2005. 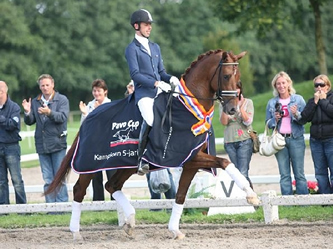 In 2007 he was Champion of the Pavo cup for 5 year-old dressage horses. 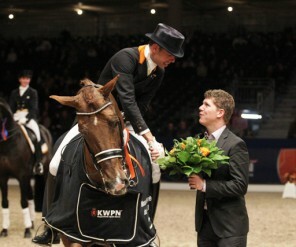 (Guest riders Carl Hester and Seth Bosman, gave Vivaldi the maximum of 100 points.) In 2007 Vivaldi achieved first place in the Stallion Competition Hengelo, 2007/2008. 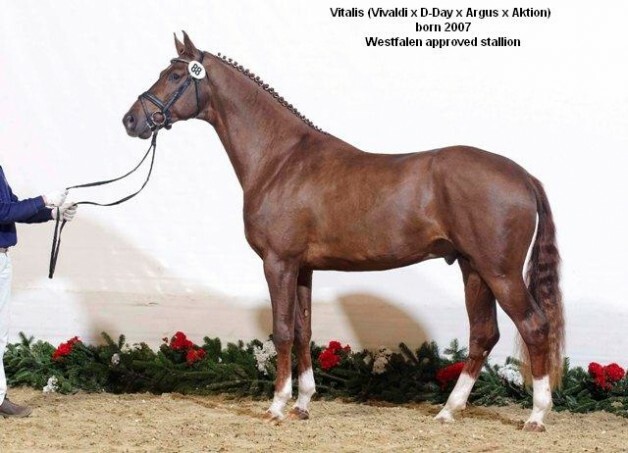 From his first crops of foals Vivaldi clearly transmits his quality to his offspring, which is backed up by his KWPN offspring report: "A very uniform collection of well developed, riding type foals with a lot of presence and a good rectangular model. 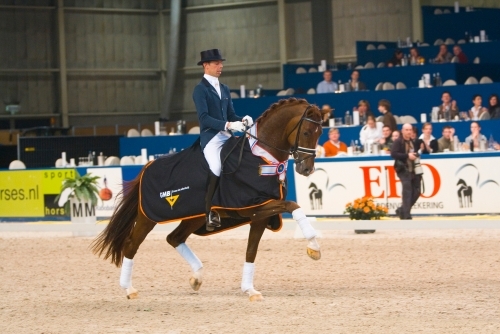 The foals move with a good leg technique, suppleness and carry themselves well. 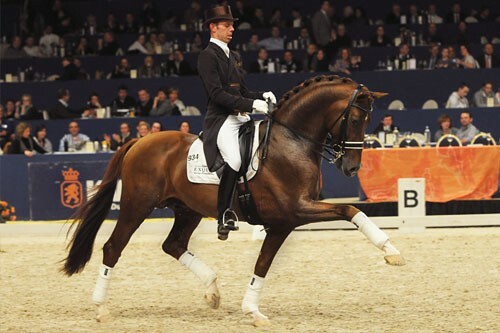 That Vivaldi n is fully worthy of his foal report is further substantiated by the fact that in 2007 he had, no less than 3 foals placed in the Championships at the National Foal Show, where, ultimately one of his foals became National Champion. 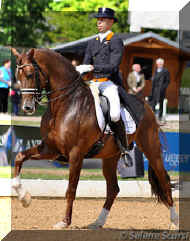 The other foals held fourth and eighth place respectively.